All transactions are safe and secure with a reliable history in online purchasing behind each of our associates. 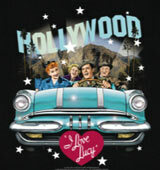 Buy the California Here We Come Lucy t-shirt to own I Love Lucy clothing and merchandise. California, here we come! The Ricardos and the Mertzes took a cross country road trip to Hollywood where Ricky was starring in a new film. The usual shenanigans follow the group throughout their journey, but they pale in comparison to what lies ahead. This I Love Lucy t-shirt reminds us of their memorable trip...including a trip to jail. Give it as a gift with Lucy Barbie Dolls, pajamas and watches. In addition to the California Here We Come Lucy tee above, browse the I Love Lucy Clothing Gallery for more apparel like men's and women's clothes, kids shirts or hoodies.